Sterkarm — (1998—2003) Young adult. According to Susan Price’s website, a third volume is expected. Publisher: “Beware of shaking hands with a Sterkarm.” For generations, the Sterkarms plundered the Scottish border. They were known for shaking on a bargain with a dagger clutched firmly in one hand — and for not keeping their promises. Now people from the 21st century have found a way to travel to the Sterkarms’ time. The 16th century is rich in natural resources and historical detail, perfect for the modern investor or scholar. 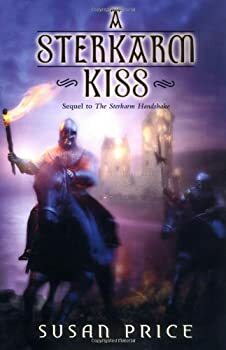 Anthropologist Andrea Mitchell finds more than research there, as she falls in love with a young Sterkarm warrior. But when he realizes how powerful and destructive the visitors truly are, he vows to keep them from his land forever. And in the bloody battle that ensues, Andrea must choose between her love and her world. In the 21st century an invention has finally been perfected: The Time Tube, which allows contemporary scientists, researches and corporate moneymakers to travel back into the 16th century and mingle with the locals there. Think of the possibilities! Plentiful supplies of oil, gold and coal, an extraordinary opportunity to study ancient life, and a pollution-free resort for those wealthy enough to make the trip. The corporation FUP has already purchased the troublesome borderlands between 16th century Scotland and England in order to begin development. 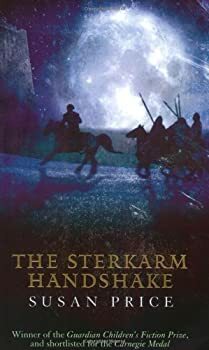 The novel that preceded this, The Sterkarm Handshake was an explosive, riveting and nail-biting story based around the concept of the cultural clash that would follow 21st century time travelers attempting to exploit the riches and opportunities that the past had to offer. The corporation FUP had completed a Time Tube that would transport employees into the past of a different dimension, in order to explore the possibilities that the unspoilt land offered. Only one thing stood in their way; the fierce and treacherous Sterkarms who were not prepared to stop their feuding and troublemaking just because a bunch of "Elves" asked them to. Ghost World — (1987—1993) Ages 9-12. Publisher: Czar Guidon kept his son Safa imprisoned in a tower. His power could only be matched by the witch — girl Chingis. Out of the frozen wastes she studied the words and runes that would give her power to understand the messages of the ghost drum. At last she heard Safa’s cries… This book was awarded the 1987 Library Association’s Carnegie Medal. Elfgift — (1995—1996) Young adult. Publisher: Elfgift is a half — breed, a devil — spawn, an illegitimate child of a king. And now Elfgift’s dying father has named the thing his heir. But Elfgift has legitimate brothers, who have been brought up as members of the court. No elf — child will deprive them of their birthright. Odin — (2005—2008) Young adult. Kylie and Affie, two teens from opposite sides of the track, are thrown together as their roles in society suddenly change. The great god Odin, begins to communicate through Kylie. Pampered and precious Affie is sold as a slave after her father’s suicide. A stunning futuristic fantasy. Where the wealthy are genetically designed and slavery is a fact of life. CLICK HERE FOR MORE NOVELS BY SUSAN PRICE.